The Rev. Vladimir Zablotskyy moved to Buffalo in August 2011 to breathe some life into the struggling SS. Peter and Paul Orthodox Church on Ideal Street in Lovejoy. 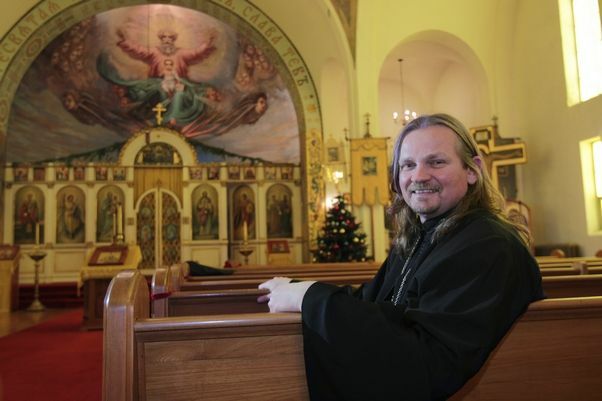 Originally from the Ukraine, Zablotskyy moved here from New Jersey with his wife, Jeanne, to serve as acting rector for the small but loyal congregation. Soon after the Zablotskyys introduced a parish a soup kitchen which offers lunch from 11 a.m. to 1 p.m. on the last two Saturdays of each month. The couple also launched an online cooking show (http://occs.peterandpauloca.com). The Orthodox Christian Cooking Show just taped its 13th segment. The Zablotskyys are determined to grow their congregation just like they grew their vegetable garden which last summer yielded four bushels of eggplant and tomato plants as tall as the 6-foot-2-inch inch priest. People Talk: Is priesthood all it’s cracked up to be? Vladimir Zablotskyy: It’s more of a challenge and more fulfilling than I ever expected. Even the fact they call me father already implies a relationship. You are present from birth through life at very important stages in the lives of your parishioners. You are granted an opportunity to touch them on levels nobody else can. PT: What is your forte as a priest? VZ: One-on-one listening and talking to people because as a priest you are put on a public stand where you have to preach, conduct services. But the moment no one else sees but you and maybe God is when the true miracle happens. PT: Describe a challenge of your job. VZ: When we came here the relationship between the parish and neighborhood was almost nonexistent. In fact many people thought the parish was closed. We decided to introduce the soup kitchen because we are not a rich neighborhood. Hunger is one of the easiest things to combat because all you have to do is cook. PT: What sparked your kitchen wizardry? VZ: I don’t call it wizardry. I love to cook personally. My wife, she is an excellent chef and a baker. PT: You’re known for your sourdough bread. How long does it take you to make and bake it? VZ: The entire process takes anywhere from 16 to 27 hours. My physical labor? Less than two hours. It takes sourdough longer to rise. Sourdough starter does not utilize commercial yeast. It’s a colony of bacteria and yeast, and you create a special environment for it to reproduce. Once you do that, sourdough starter is like a pet. You constantly have to feed it. PT: What guided you to the path of priesthood? VZ: That’s a deep question. You remember the country that used to be called Soviet Union? I grew up there just prior to its collapse. In fact my first year in the seminary was 1991. You felt there was a huge change coming because growing up every subject we studied was used to prove religion was bad for you because that was the policy of the communist regime. In my home, we were brought up to believe in the church. Once communism collapsed and you were free to go to church, it was just an indescribable feeling. VZ: I love computers. I’m a geek. I like a little bit of programming. I like languages, too. I speak several in addition to English – Russian, Ukrainian, Polish, Italian. PT: What was your first job? VZ: Herding cows. I grew up in a small village in the Ukraine. It’s called Pidhorodne in the western part closer to Poland. In the first grade I wanted to be an astronaut. PT: You have a green thumb, I hear. VZ: I do, and I don’t use any chemicals in our church garden. I do something called worm composting. My tomato plants were taller than I, and I’m 6 foot 2. There were so many tomatoes we didn’t know what to do with them. This year I am expanding. I didn’t have enough cucumbers. We didn’t have any pumpkins. We use the food for Sunday coffee hours and our soup kitchen. Besides praying, if we didn’t have social hours there would be no means to build community. PT: How many parishioners does your church have? VZ: We only have 33 members officially but by my estimates we have 60. On a good Sunday, we get 50 people in church. Seventy percent of my congregation travel to church from the suburbs. PT: What stresses you out about running a parish? VZ: Gas bills. The financial part of it can be overwhelming. When I was in the seminary nobody taught me how to fix a broken pipe. It wasn’t in the curriculum. Because the parish is so small you try to be master or jack-of-all-trades, but you don’t have to. All you have to do is pick up a phone. Shortly after we came here, part of the copper roof on the church was stolen, as was the Gospel book. PT: What class did you ace in the seminary? VZ: Scripture. In a way it prepares you because most of what we do in church is based on the Bible, and if you don’t study the Bible it would not be so good. PT: Tell me about your work day. VZ: I pray in the morning and before I go to sleep, and I visit parishioners who are sick or homebound. Sometimes people want me to pray with them, or to help them move furniture. I’m pretty much on call with a small congregation like mine. PT: What is a challenge you face in growing your congregation? VZ: It has to do with young families. The church has to compete with many activities children are involved in. Most of them take place on Saturday or Sunday. If you don’t grab children at an early age, it will be very difficult to influence them once they are teens. PT: What is the most important role you serve? VZ: Show people how to get to heaven. Can you top that one?